Women's Super League One top scorer Beth Mead is among four players called up to the England squad for the first time for their international friendly tournament in China. 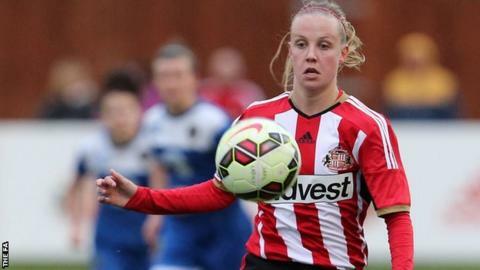 The Sunderland striker, who scored 12 goals in WSL 1, was overlooked for last month's Euro 2017 qualifier in Estonia. Chelsea's uncapped trio Hannah Blundell, Laura Coombs and Drew Spence have also been selected. England face hosts China and Australia in the tournament starting next week. While 20-year-old Mead, who has just completed her first season of top-flight football, was left out of England's opening European Championship qualifier, she was invited, alongside Blundell and Coombs, to be part of the training camp in preparation for the match. "I am delighted to welcome the new players into the group," England manager Mark Sampson said. "They have all shown potential with their clubs or when they trained with our group prior to the World Cup. The player pool in England is growing, and creating strong competition for places is crucial to driving our players and our team to the next level. "The tournament is an opportunity for the team to continue to grow and a chance for our new players to lay down a marker and demonstrate their international capabilities." Eight of Chelsea's WSL 1-winning side, including forwards Eniola Aluko, Gemma Davison and Fran Kirby, have been included in Sampson's squad of 21. Forward Lianne Sanderson, who left Arsenal to join Portland Thorns in the United States on her return from the summer's World Cup, is recalled for the first time since England's bronze medal success in Canada. Sanderson's Portland team-mate Jodie Taylor is the only other overseas-based player selected. Goalkeeper Mary Earps, whose relegated Bristol Academy side conceded 61 goals in 2015, is again included in the squad after being brought in as an injury replacement last month. Defender Alex Scott is the only Arsenal player named, with Sampson opting to rest other members of the Gunners' squad and all Notts County players as they prepare for the Continental Tyres Cup final at Rotherham on 1 November.